Days after the 2016 election, New York Times columnist David Brooks wrote that “we simply don’t yet know how much racism or misogyny motivated Trump voters.” That’s not entirely true. Trump’s election provides an important case study in exploring how racism and misogyny galvanized support for an authoritarian populist — and how progressives can fight back against these attacks. Trump’s model of white exclusionary populism and explicit racism will become a more viable electoral strategy as whites begin to see themselves as a group facing discrimination and as racial resentment further sorts the public along partisan lines. Many women are actually seeking special favors, such as hiring policies that favor them over men, under the guise of asking for equality. Women are too easily offended. Women seek to gain power by getting control over men. Schaffner finds that these two factors can explain the gap between college and non-college educated whites. He told Salon, "The gap between college and non-college whites was the largest we've seen since at least 1980, but attitudes on racism and sexism account for most of that gap." 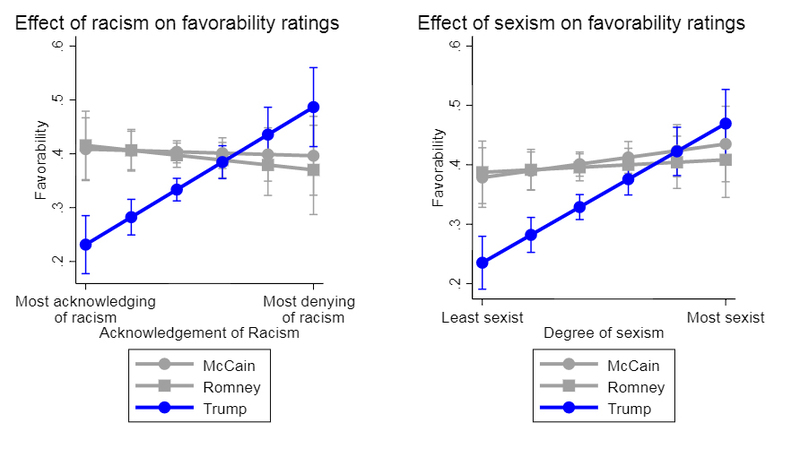 He finds that racism and misogyny more strongly predict support for Trump than economic anxiety (which aligns with my work with political scientist Jason McDaniel). As political scientist Michael Tesler has shown, racial resentment was actually a stronger predictor of white voting in 2016 than it was in 2008. “It's much easier to say Trump support was about economic anxiety than to say it was about sexism or racism," Schaffner said. "But just because that's an easier story to tell doesn't mean it's the most accurate one. Yes, economic anxiety mattered, but views on gender and race mattered more." In the children’s television show "Dora the Explorer," Dora can easily dispatch the show’s villain, Swiper the fox. If Dora sees him, and she shouts “Swiper, no swiping!” he disappears. For a long time, liberals have treated racism like Swiper, believing that loudly decrying its existence was enough to defeat it. The reason that coded appeals were coded was to prevent a backlash, as Republican strategist Lee Atwater famously verbalized. This strategy had some empirical support and it may have worked for several decades when politicians worked hard to avoid the impression (though rarely the reality) that they were manipulating white racial anxieties for votes. Our results show that people may no longer reject racially hostile appeals even when they are quite direct and explicit rather than subtle. The fact that some people are not angered by a politician using rhetoric that they themselves know is racially insensitive helps explain why some of [Hillary] Clinton's campaign ads highlighting this rhetoric [were] not particularly persuasive. Calling out racial rhetoric was presumed to make people reject the original message, but our work suggests that this is no longer effective for large swaths of American citizens. Why might overtly racist appeals be more effective in the age of Trump than before? The first reason is partisan sorting — the process by which racially liberal whites have gravitated toward the Democratic Party while racially conservative whites have moved to the Republican Party. This means that within the Republican Party, there are no voices to call out racism. Another is simply confirmation bias — many white people trust Trump when he says he’s not a racist, and Republicans who criticize him are quickly seen as part of the establishment. In addition, whites now see themselves as a coherent group facing discrimination, and therefore don’t find Trump’s rhetoric offensive. A recent study finds that telling whites they will soon make up less than half of the population increased their support for Trump and anti-immigrant policies. Another finds that as whites begin to understand themselves as a coherent group, they are more likely to endorse racial stereotypes. Among whites who believe that it is “extremely important” for white people to work together to change laws unfair to them, 70 percent support Trump. Among those who think it is “not at all important,” 44 percent do. A final factor at work may well be the Republican normalization of racism. For all the pains Clinton took to divorce the GOP from Trump’s racism, it is very much an extension of their politics for the last eight years. During Barack Obama’s presidency, racism became normalized in the GOP, from the birtherism pushed by Trump to Newt Gingrich's “food stamp president” comment to an Iowa GOP official posting a trap for Obama baited with watermelon. A more effective response can be found in the recent framework paper written by legal scholar Ian Haney-Lopez (who is also a senior fellow at Demos) and political scientist Dorian Warren, two scholars who study racism in politics. In their paper, which was written for the AFL-CIO, they argue: “To enlist many whites in the battle against racism requires demonstrating to whites that by voting according to dog whistle appeals, they’re wrecking their own lives — their work conditions and wages, their pensions, their health care, the education and future of their children.” Creating spaces for people to understand their common goals is incredibly valuable and not unprecedented historically. In a study of implicit racial appeals, political scientists Matthew Tokeshi and Tali Mendelberg find that the most effective method to defeat a racist appeal is to engage with and rebut the attack, and then explain how it is used to divide and distract. 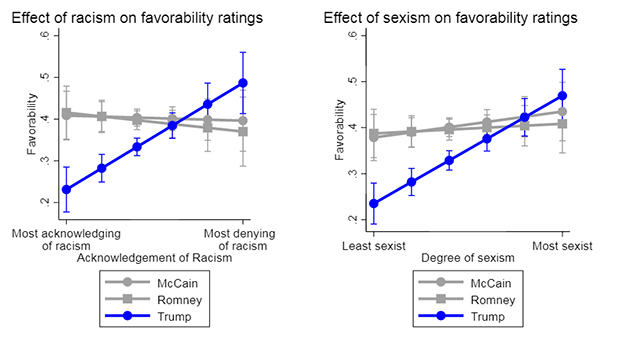 The authors find that ignoring the racial appeals is the least effective approach and the distraction method (e.g., focusing exclusively on the opposing candidate’s poor record on the economy) is also ineffective. When I discussed Trump with Mendelberg, she noted that even Trump had to maintain plausible deniability by, for instance, attacking undocumented Latino immigrants while saying, “Some, I assume are good people.” As David Duke’s recent defeat shows, there are some lines politicians can’t cross, though they have been blurred. The work Heather and Gary continue to put into defeating prejudice will be long and difficult. But it is not unprecedented. Consider journalist Tana Ganeva’s fascinating work on the alliance between the Black Panthers, the Young Lords (a Latino group) and poor whites to fight Chicago Mayor Richard Daley’s policies. Under John Lewis, the Congress of Industrial Organizations worked to unionize black workers (who were often called in as scabs) and advocated for anti-lynching bills and voting rights. The union ran pamphlets on the importance of cross-racial alliances. These efforts required long-term work, not a single conversation or a well-cut ad. Fighting racism is a hell of a lot harder than using it to win elections.